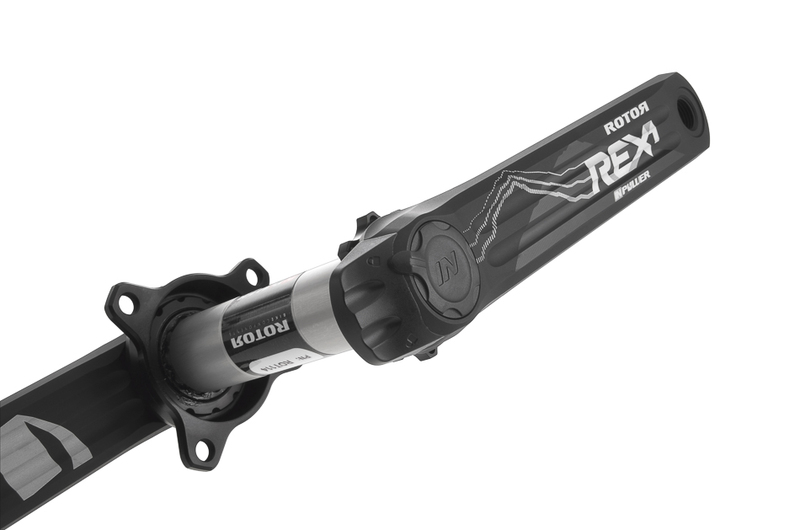 Frankly, I’ve never wanted to be a pro bike racer, so I didn’t find myself very excited when Rotor invited me to check out their new power meter-equipped Rex mountain bike cranks. I’ve never taken training very seriously and in the short-lived periods when I’ve tried to get on a training regimen, I’ve always fallen off the wagon due to either a perceived lack of progress or a complete dearth in direction. However, when correctly utilized, a power meter provides objective measurements that, properly interpreted, can provide both a sense of progress and a direction for further improvement. It’s a pretty useful tool, if that’s your cup of tea. Power is measured from the left crank arm a via strain gauge tucked away inside the axle, along with the battery and almost all the other electronic bits. The only external electronic device is the transmitter, which is positioned on the left crank arm above the battery door. The electronic components are manufactured by Indra, a multinational technology company based down the street from Rotor in Madrid, Spain. 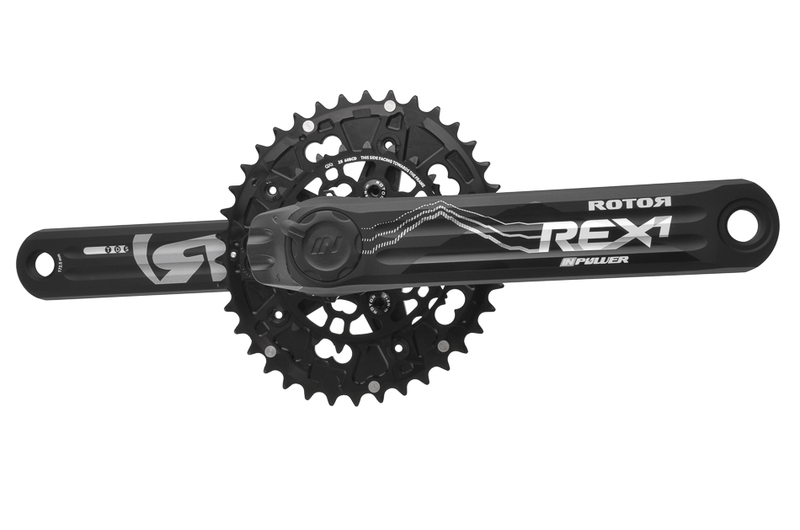 Rotor’s Rex 1.2 crankset weighs in at 562 grams, and is CNC machined for weight savings. One of the pragmatic selling points of the Rotor INpower Rex cranks is the use of a single AA battery as the power source. No tools are required to access the battery compartment, which is sealed away behind the turn-to-open cap on the outside of the left crank arm. One AA battery provides a claimed 300 hours of power, and rechargeable batteries are a-okay. Rotor has its bases covered here, with their UBB30 axle system providing nearly universal frame compatibility: the only modern bottom bracket shell that cannot accept a Rex crankset is Trek’s BB95. See the compatibility chart below for the full list. Not shown in the chart is the Rex 3 crankset, which can replace cranksets with 24-millimeter spindles. If you already have a Rotor crankset with a 30-millimeter spindle, you can purchase only the Rex left crank and enjoy the benefits of the in-axle system. The new cranks will be compatible with all ANT+ devices. A power meter is a relatively limited tool without data analysis software. Rotor doesn’t tack on an additional software charge, and updates will be transmitted via an ANT+ USB, which cost around $25. Firmware for the power meters will be provided online, so users won’t have to send their cranks in to be updated. Rotor also has two new digital training features, which I’ll get into below. Torque 360 is a graph of your complete pedal stroke, allowing you to see where maximum power output is happening. OCA (Optimum Chainring Angle) translates a rider’s Torque 360 data into an individualized, optimal angle for Rotor’s oval Q-Rings. Torque effectiveness is the ratio of total torque to positive torque. Negative torque results from the dead weight created when you don’t unweight your leg on the upstroke of your pedal rotation, causing your opposite leg to do more work on the downstroke. Rotor’s new cranksets can translate that metric in real time to an ANT+ receiver, such as a Garmin. Pedal smoothness is a measure of how consistent your stroke is, based on a ratio of maximum power to average power output. Rotor INpower Rex cranksets range in price from $939 to $1079, which, while by no means cheap, is a solid value compared to what else is available. See the price table below. I only had a few hours to lay the power down on the Rex 1 cranks, so these impressions are very preliminary. As far as the cranks just being cranks, they felt good. Plenty stiff, creak-free and competitive with other high-end cranks in terms of weight. The Torque Effectiveness reading wasn’t reaching the Garmin 1000 I tested the cranks with, which was chalked up to outdated firmware. No big deal, but I have to wonder how much of an issue firmware availability will be when it comes to getting your ANT+ device synced up with Rotor’s unique Torque Effectiveness and Pedal Smoothness metrics. Of the whole shebang, I was most in love with the oval Q-Ring, which I’ve given more attention to in a separate post.